It takes time to find the right products and stylers, so let us break it down for you with the best flat iron for thick hair reviews. 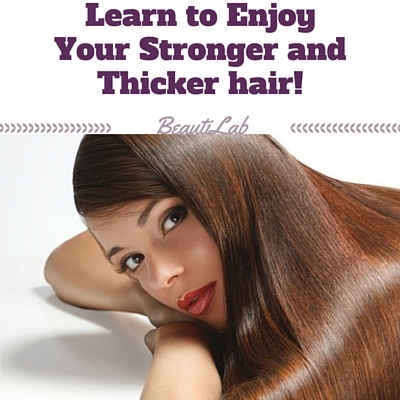 Thick hair is hair that is both thicker in the actual texture of each strand and greater in quantity than thinner hair. Simply put, there’s just more of it. And because of this, it takes more time and care to style and straighten thick hair. Because naturally curly or wavy hair can easily look damaged or frizzy when you finally see it looking perfectly straight, the most important thing is to choose the right products before you even get down to the business of flat ironing. Make sure you’ve got an anti-frizz shampoo and conditioner though you may want to use the conditioner lightly so as not to weigh down your hair. Use a heat-protecting spray before you apply any form of heat to spare your cuticles from damage. You might also want to keep a smoothing oil or serum on hand for those extra flyaways, especially in the summer or days with high humidity. 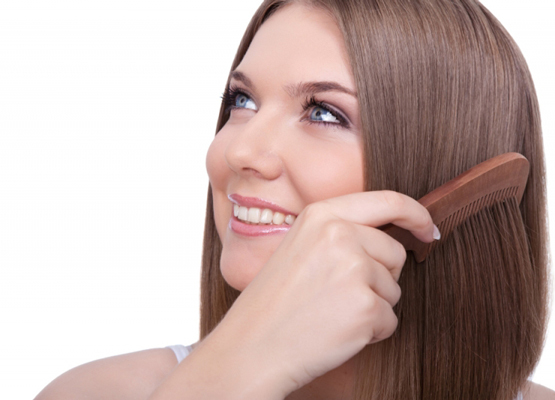 11 How do you know if you have thick or thin hair? 14 Straightening Thick Hair Will Not Be a Nightmare Anymore! 16 How to Curl Thick Hair with a Flat Iron? Straightening your thick hair is never the easiest of tasks. That is why when a newer device comes along that makes this job go faster and easier we want to tell you about it. Such is the case with the Megastar Flat Iron from NuMe. This product is loaded with great features that make straightening your thick hair simple and easy. An example of this is its 100% tourmaline ceramic heat (you can set the temperature from 190°F to 450°F) that enables this device to be ready for use in under a minute and then distributes nice, even high heat throughout every hair that comes into contact with its 1 inch wide heater plates. One thing we really like about this hair straightening tool is the fact that it uses negative ion conditioning technology to help straighten your hair. This technology helps cut down on hair resistance, helps eliminate frizz and also will leave your hair with more shine. It also has a gentle infrared heating strip that helps the heat quickly penetrate deeply into the shafts of your hair to make them easier to straighten. With this flat iron, there is also a nice bounce-back feature when you clamp the flat iron down on a section of hair; this prevents over clamping so the device slides smoothly over your hair as you use it. This flat iron is slightly to the weighty side but it works fast and efficiently so for the short time you use it that should not really be a big factor. Its dual voltage capability makes it an excellent choice for a travel iron to travel to different countries with you. If you have been struggling to straighten your hair with your older model flat iron maybe it’s time you upgrade to a newer model. A model like the GVP Sally Beauty Digital Ceramic Flat Iron would be an excellent choice if you decide to make a change for the better. This efficient flat iron from GVP has such great features as evenly dispersed ceramic heat, an easy to hold and use design, and its slightly curved edged plates help you add style to your hair as you straighten it. One of the best features of this quality hair straightening product is that it has 29 adjustable heat settings (160°F – 450°F). All too often a big complaint of flat iron users is they don’t have choices as far as the temperature they get to use their flat iron at. 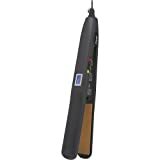 That problem is solved with this model flat iron as you get the temperature flexibility you demand with it. The set temperature is also displayed in an easy to see digital readout window. 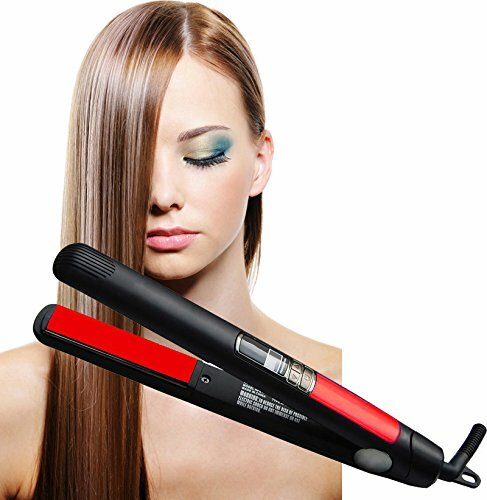 When you factor in other handy features such as its 9 feet super long power cord with a swivel end that allows for easy movement as you use it and the fact that it can travel with you worldwide thanks to its dual voltage capability, that makes this model a really nice choice as far as versatile flat irons are concerned. The Babyliss Pro Titanium plated iron is meant to give sleek straightened hair. The ceramic plates are coated with titanium to improve the heating capacity of the iron. The titanium heats up extremely fast achieving maximum temperature o450f in 40 seconds. The ceramic heater emits negative ions to give you-you less frizz and smoother shinier hair. The ions also condition your hair giving life to dry, damaged or color-treated hair. The ceramic plates provide significant heat recovery for styling efficiency. You don’t have to worry about the housing of the plates becoming just as hot because it’s made of stay-cool Ryton material. This material resists the ultra-high temperatures of the plates, making it easy to handle the iron. The titanium-plated plates glide effortlessly down your hair without snagging or tugging at your locks. The iron has an auto shut off system that will kick in after 60 minutes. This leaves you assured that you wouldn’t find other items burnt or the iron melted from overheating if left on for too long. An 8-foot swivel cord will give you the freedom to move as you style and not create a tangled up mess. The position of the temperature dial and the on-off buttons is poorly placed. You could easily switch it off if you aren’t attentive during your hair styling process. The sides of the iron could burn your scalp if you hold it horizontally near your forehead area. Overall this iron has amazing features for an entry-level flat iron at an economical price. naturally found on the strand by closing the cuticles on a hair strand .this produces healthier, shinier and smoother hair. If you have thick hair, part it into small portions for it to get evenly straightened out. The long 8-foot swivel cord makes styling flexible and is convenient when power inputs are not positioned in an area you’d like to style in. The iron will recover heat quickly after every portion of hair is straightened which saves up on time that would otherwise be used to wait for reheating. The handle is made off nonslip material that ensures your grip on the iron is firm.The iron has an ergonomic design with the buttons situated at favorable positions. The iron has a dual voltage that allows you travel with it overseas. Its sleek black design is made with that perfect marriage of ceramic and tourmaline crystals. The combination of negative ions and far infrared technology in hair straightener’s cushioned plates heats hair from the inside out to seal the cuticle and reduce frizz and static. 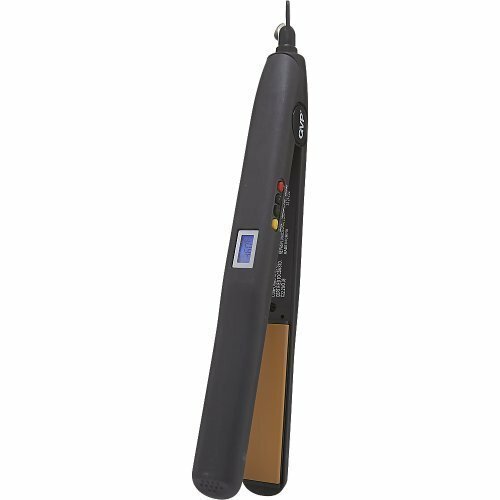 The flat iron reaches a high heat of 410F so you only have to make one pass through your hair, but there are also multiple heat settings on its LCD control for accurate temperature reading. That extra ¼ inch is perfect for longer hair. It’s lightweight at 1.2 pounds and features dual voltage so you can easily pack up and bring the flat iron with you. 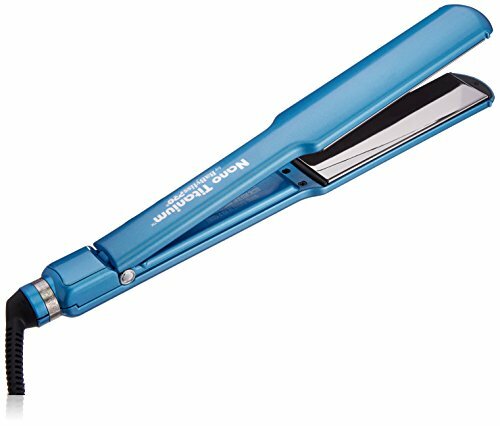 The high concentration of negative ions from the tourmaline ceramic plates of this flat iron is the key to getting rid of frizz with each pass. Your natural shine comes out as you straighten each section. It’s super lightweight so you can glide through your hair strand by strand without any hot or cool spots. 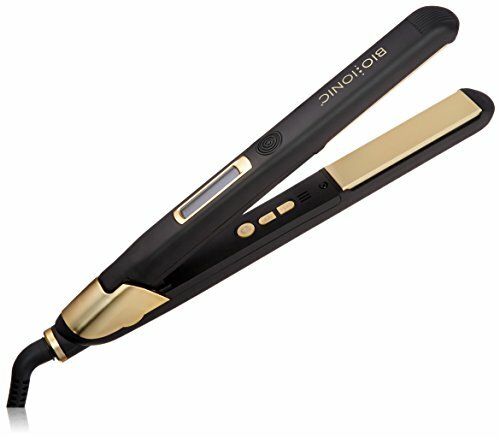 Ceramic flat irons always maintain its heat evenly. It heats up instantly to 410F with a temperature dial for lower settings. CHI products are famously durable, so this is bound to be one of the best for thick hair that stays with you for years. This flat iron guarantees salon-quality results. For hair that you sometimes like to grow out but then cut again, a one-inch is the way to go. 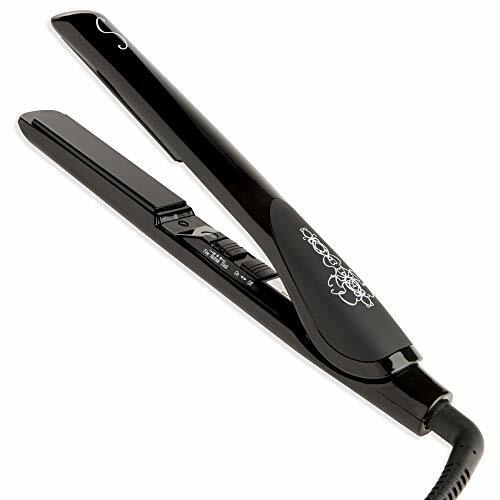 This is the fan favorite of professional level hair straighteners because it does a little of everything. The pivoting plates are made of 100% solid ceramic and tourmaline, which is the best combination for serious heat and shine. The 360-degree swivel cord means you can flip from side to side of your hair with ease, no matter which hand you use. The digital temperature display is LCD and ranges from 175F to 450F, making it one of the most accurate flat irons available. Just set the temperature, and in seconds, it’s ready to use. The hair straightener features both auto shut off for safety and quick heat recovery time for touch-ups. Those with thick hair know how hard it is to keep it straight for long periods of time. It is hard even to get it straight enough, to begin with. This is where the bio ionic OnePass comes in. With temperatures that reach a high of 450f, you can be assured of straight hair. The Iron has 1.5-inch plates that are the best for thick hair as they hold it down than smaller sized plates. Smoothing out your hair requires smaller sections on the iron at a time for thick hair to be completely straightened. Luckily the OnePass live up to its name, and you don’t need to keep going back to a portion of hair. Fewer pass means time saved. The iron has a 9-foot swivel cord with a Velcro strip for easy storage. The iron’s ceramic plates provide even heating and give you a balanced look. The negative ions emitted fight frizz and the ceramic mineral complex will condition the hair and lock in moisture. The sides of the iron are rounded to create softer looks. The controls are located in between the plates. The ergonomic design makes this device easy to use, and a finger grip on the handle’s an added advantage. Here is a quick overview of thick hair properties and why flat iron products are so effective at straightening your hair. How do you know if you have thick or thin hair? This may seem like a no-brainer but it’s really not because some people confuse dense hair (the amount of hair strands coming out of your head) with the thickness of hair (the diameter of your individual hair strands). It’s important to know if your hair is thin or thick so you pick out the right products to use on it such as flat irons. You can tell if your hair is thin or thick by placing a single strand of it between your thumb and forefinger and then pulling it out with your other hand. If you don’t feel it or hardly feel it when the hair strand is pulled out your hair is to the thinner side. If the feeling is pronounced then chances are your hair is to the thick side. You know a flat iron can straighten your hair efficiently but did you know why it can do this? Here is a little bit more information on the key features of your flat iron and the role they play in straightening your hair. Hair curls because it has strong hydrogen bonds. The curlier the hair the stronger these bonds are and that means the tougher your hair is to straighten. 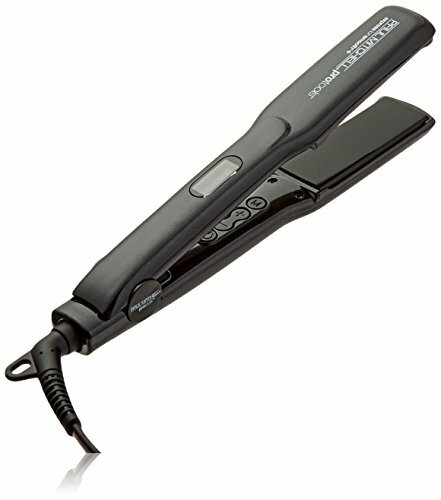 Why do all tools for straightening hair use heat? The answer is because heat is the best way to loosen these hydrogen bonds and that gives you the best chance of getting your hair as straight as possible. Many people prefer flat irons for use on very thick hair because they have the highest heat settings of any electric hair straightening devices. The heat they produce rapidly breaks down the tough hydrogen bonds in thick hair and allows it to be straightened. Once the hair has been straightened it stays that way thanks to the hydrogen bonds reforming again in the hairs new straight form as it cools. Most flat irons have temperatures that are over 400 degrees which is plenty high enough to help straighten your hair easily. The width of the heating plates your flat iron has plays a big role in how well your flat iron will work on your hair too. That is because the more surface area that the flat iron plates have the amount of hair they can trap and super hit so it loses its curl and can be straightened. Since thick hair demands more heat in order to be straightened it only makes sense that a wider heating plate will work better if you have thick hair. For moderately thick hair you should use a flat iron with a plate size that is between 1 – 1 ½ inches wide. If you have very thick hair it will require a flat iron plate size that is 1 ½ to 2 inches wide in order to get the best result when straightening your hair. Some manufacturers will add this type of technology to help reduce frizz and static electricity which can make your hair very difficult to straighten. This is especially true for people who have thick hair like yourself. If your hair is frizzy and full of static you will have trouble controlling it with a flat iron as you style and tends to leave a result which can best be described as big and poufy. By adding negative ions it takes the poufiness out of your hair during the straightening process and leaves you with sleeker and more organized hair strands. Straightening Thick Hair Will Not Be a Nightmare Anymore! 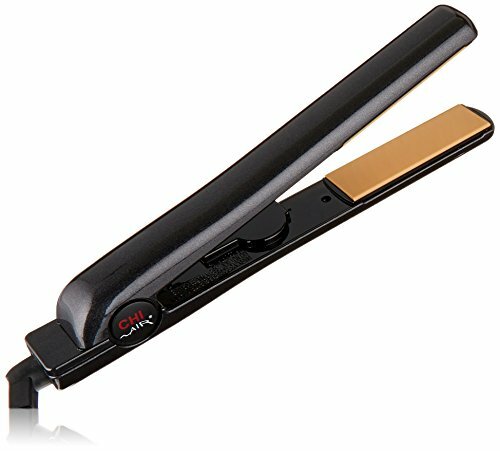 So how do you find the absolute right flat iron for thick hair? Think about these few key points. A general rule to follow is this. For shorter, thicker hair (shoulder length or less), you’ll want a smaller plate size. If your hair is longer than shoulder-length, don’t choose anything smaller than a one-inch plate. Bigger than that is even better. Make sure your flat iron is made of ceramic or titanium. One with tourmaline added to the plates will give an even bigger boost of shine because it counteracts the positive ions associated with frizz. If you have layered hair, variable heat settings are ideal so you can switch to a lighter heat for the shorter sections because you certainly don’t want to fry them. And no matter what, don’t be afraid to invest a little extra into a good well-made straightener that will be reliable for years to come. Always dry your hair completely. Applying direct heat to hair is never a good thing and will cause huge damage. Cover your hair with your heat protectant spray before blow drying and give a second quick spritz before applying the hair straightener. Separate your hair by securing the top section up, working from the back first, and slowly letting down small sections at a time until you reach the front. Using the highest heat your hair can handle but without damaging it, run the flat iron from the root to tip of each section, letting it fall gently at the end of each pass. Always give a final spray or run an anti-frizz serum to the last unruly pieces when you are finished. How to Curl Thick Hair with a Flat Iron? Due to their flat shape, a 1-inch styler is perfect. Anything larger than that is really meant for straightening hair. Make sure to choose one with rounded edges – you don’t want square or zigzag curls! The key is to keep the iron in motion and not to wrap the hair around it. Start with one section at the back of your hair. Clasp the iron to the hair, about an inch or two from the root and glide it through your hair twisting as you go to create the curl. Continue this with all other sections of hair, twisting in opposite directions to create volume. With your longest portions of hair, you can even start the heat about halfway down toward the tip to help maintain your natural length. Curls will shorten your hair, so if you don’t want them to appear too short, don’t curl too close to your roots. When you release each curl, allow them to fall loosely. You might want to hold each one with your hand for a few seconds as they begin to cool so that the weight of the hair doesn’t undo all your hard work. If you have bangs, you don’t even need to use a flat iron on them. A hair dryer will do the trick. Without bangs, curl these last front sections toward or away from your face. Using your fingers will give separate beach-like curls while brushing gently will create more uniform waves (think vintage actress). Whether you need high heat or extra high heat or durability for years to come, you simply can’t go wrong with one of these flat irons. There is nothing worse than dry, damaged or frizzy hair, so the right straightener for thick hair feature the best of the best in materials and technology so that your natural shine will always come out. These are hands down the best flat irons for thick hair reviews! They are versatile for your ever-changing style, in both look and length, but will always take care of your delicate locks and leave them healthy and strong.